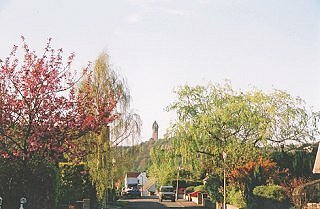 A hamlet on the River Forth, Cambuskenneth lies a mile (1.5 km) to the east of Stirling. The imposing three-storeyed Campanile is all that survives of Cambuskenneth Abbey which was founded for Augustinian Canons in 1147 by King David I. Closely linked to the royal castle of Stirling, the Abbey grew to immense wealth and importance in mediaeval times and it was here that King James III was buried after his death at the Battle of Sauchieburn. Having passed to the Erskine family from the church following the Reformation, the lands of Cambuskenneth were acquired by Cowane's Hospital in Stirling from Sir John Erskine of Alva in 1709, including the right to run a ferry across the Forth. The ferry was replaced by a pedestrian bridge in 1935, but this soon brought the closure of the Cambuskenneth School as pupils could now easily cross to Riverside in Stirling. The orchards of Cambuskenneth attracted the group of artists known as the 'Glasgow Boys' in the late 1880s, with E.A. Walton (1860 - 1922) and Arthur Melville (1854 - 1904) taking studios here.